The Zeiss Victory DiaScope 85 T*FL spotting scope… Okay, that’s what Zeiss calls it officially and it makes us tired just to type it all in. On the other hand, we will never get tired of looking through this beautiful scope. We’ll just come up with shorter names for it! 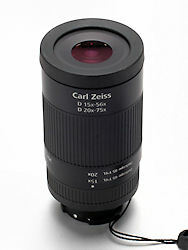 The 85-mm Zeiss DiaScope (see?!) was re-designed and released in April of 2010 but for some reason, we never got one in to play with until quite recently, a fact we began to regret as soon as we began using it in the field. Victory FL 85 scopes come in both straight and angled configurations, and are now available only in black – gone are the moss green and silver versions. Make no mistake, this re-design was a major overhaul and what was already an excellent spotting scope is now significantly better, thanks to a new eyepiece, better image performance and excellent digiscoping options. When you think of the brand name “Zeiss Victory FL”, you should immediately think of amazingly bright images provided by that fluoride glass. We reviewed both straight and angled models equipped with the new Vario D 20-75x zoom eyepiece. Zeiss literature claims that a large improvement in image quality was achieved by design changes that minimized stray light, resulting in improved contrast. That’s hard to verify, but what we can say is that the image quality is superb: bright and sharp at dawn and dusk or under overcast conditions. At first you don’t notice it, because when you are using it, you tend to focus only on what you are seeing. Then you take your eye away from the eyepiece and realize with a start how dark it’s gotten… and how late you are getting home! The image quality is dangerously seductive! The brightness of the DiaScope 85 comes into play if you plan on viewing anything at dusk or dawn, peak activity times for nature watchers, but it is also a major factor in photography (see below). The heart of the optical system is the fluoride glass, which helps reduce the splitting that occurs as light passes through the lenses and prisms. The fluoride glass helps to focus all the light wavelengths on the same plane, yielding sharper images with more zing. To this, Zeiss adds their proprietary T*multicoating, for enhanced light transmission and greater color fidelity. Lastly, Zeiss adds their LotuTec® coating which makes the lenses shed water more rapidly, as well as repelling dirt and making cleaning them easier. As noted above, the total system provides image quality that is difficult to match. A quick discussion of the eyepieces for Zeiss DiaScopes is in order. Zeiss makes three eyepieces for their Victory FL spotting scopes: two zoom (Vario) eyepieces and a fixed magnification eyepiece. 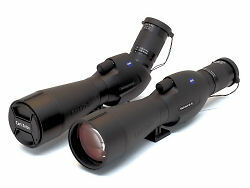 The eyepieces fit both the 65- and 85-mm DiaScopes, but yield different magnifications and variably-sized fields of view depending upon which scope they are mounted on – data below are all for the 85-mm versions. Eyepieces attach via a standard bayonet mount that now truly locks in place, an improvement from the old DiaScopes.This one is really well executed. Vario 20-75x 120-48 feet 16 mm 18.3 oz. Vario 20-60 129-60 16 mm 12.0 oz. Fixed 40x 90 feet 18 mm 8.1 oz. The new eyepieces will fit old DiaScopes, but won’t lock on them. Likewise, old eyepieces will fit the new DiaScopes, but again won’t lock. All Zeiss scope eyepieces feature eyecups that adjust with a simple twist-out mechanism. There is even a stable position between fully in and out, marked by a subtle detent. The mechanism is gradual and offers sufficient resistance that virtually all positions of the eyecup are remarkably stable. We never had one collapse in the field in all our hours of field testing, which is excellent performance in this regard. One last note on eyepieces: Zeiss themselves recommend the 20-75x eyepiece for use in digiscoping. The 85-mm Victory FL scopes weigh 4 lbs, 6 oz. and the eyepiece add another 18 oz. This is a factor to take into account when selecting a tripod – you will want something sturdy and significant to stabilize and protect your investment. The straight DiaScope 85 is about 18 inches long with the 20-75x eyepiece in place (the angled model is ~1 inch shorter). 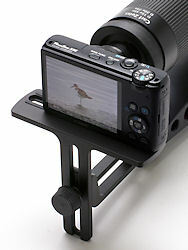 The tripod mounting bracket has a standard thread mount and an anti-twist pin socket. Like virtually all scopes today, Victory DiaScopes have the tripod-mounting bracket attached to a ring within which the body of the scope rotates. The scopes can rotate +/-135° off vertical with detents every 45°. The chassis are very solid, with rubber armoring protecting the entire optic. All Zeiss DiaScopes are completely sealed to render them water- and dust-proof, and nitrogen-purged to prevent internal fogging. The lens hood is black and slides out quite easily but stays in place well in the field. The lens hood has a molded-in sighting device to aid in aiming the scope at a desired target. Zeiss did something else we really like and see far too little of: they engineered thread mountings for filters or adapters into the barrel end of the objective lens. This allows the use of a UV filter to prevent the objective lens from getting scratched. Filters are much cheaper to replace than scopes! The Zeiss DiaScopes employ a new dual-speed focusing system in which both the coarse and fine focus are combined in one knob. When you first move the focus knob, it is in fine mode, with approximately a third of a turn in either direction. Moving the knob continually in either direction engages the coarse or rapid focus. The focus mechanism has a fairly shallow pitch, requiring just over six full turns of the focus knob to go from minimum close focus to infinity. The coarse focus is intentionally stiff, while the fine focus is much smoother. For people used to a standard dual focus knob system, this dual focusing mechanism takes a little getting used to. We polled a number of people on the subject, and found nearly an even split: some liked it and some didn’t. What we can tell you is that you get used to it fairly quickly, and soon you don’t notice anything different. While we’re on the subject, Zeiss lists their minimum close focus for the 85-mm FL scope at 16.25 feet, but we easily achieved sharp focus at just 14.25 feet. That statistic will vary with the user, but it is excellent performance for a full-sized scope on this property. Minimum close focus becomes quite important when digiscoping. Zeiss does support several types of digiscoping options for the DiaScope 85. An SLR camera can be attached using a standard T2 ring. They also market the Quick Camera Adapter II for positioning a standard point-and-shoot digital camera behind the scope eyepiece. The Quick Camera Adapter II fits both the angled and straight configurations with adjustment of a single set-screw. This adapter is designed solely to fit Zeiss spotting scopes. The scope mounts on the adapter by screwing it directly into the tripod-mounting bracket. The entire assembly is then mounted on a quick-release plate to connect to a tripod. 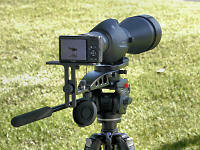 The adapter is designed to swing out of the way to allow the scope to be used for normal viewing. A spring-loaded pin locks the system when the camera is in place, but it can be set in non-locking mode to allow quick switching to viewing mode. Like all digiscoping systems, mastering this one takes practice, but we found ourselves getting decent shots right away (insert photo example). More to the point, digiscoping is governed by the quality of the optic. At least with a scope of this quality, truly excellent photos are readily obtainable – it’s just up to you to execute. The Zeiss Victory DiaScope 85 T*FL spotting scopes are usually sold as body-only or in combination with the Vario zoom eyepiece. Currently, Zeiss is offering a variety of special bundles that include a scope body, an eyepiece and a tripod. The aluminum tripod is the one we field-tested for this review and it’s a decent tripod without too many frills or extras. At this price, the aluminum tripod is, literally, free. The carbon fiber tripod raises the price of the bundle $400 relative to the aluminum one, but this is a Manfrotto tripod/head combination that would normally sell for $600 just by itself. The angled and straight configurations cost the same: $2,599.99 for the body only or $3,249.99 when in combination with the 20-75x Vario zoom eyepiece. The Vario eyepieces are sold separately at $799.99 for the 20-75x eyepiece and $649.99 for the 20-60x model, while the 40x fixed eyepiece costs $450.00 by itself. In today’s scope market place, there is a bewildering variety of makes and models to choose from, and you make your choice based on a number of different factors including size and weight, optical quality, photographic capability and price, or combinations of thereof. When you choose a Zeiss DiaScope 85, it is immediately evident that optical quality is what matters to you most, and anyone who sees you carrying one will know that automatically. The 85-mm DiaScopes offer an intoxicating mixture of unsurpassed brightness, razor sharp image quality and elegant design. You can’t get much more out of a scope than that. This scope has been discontinued and Zeiss has released a new series, the Victory Harpia Spotting Scopes, which come in 85mm and 95mm angled models. We expect to review the Harpias once supply catches up with demand.